It’s estimated that around 12 million smart thermostats were sold in 2018 and they continue to grow in popularity. Why shouldn’t they? They are great at helping with home efficiency. The problem is that no matter how smart your thermostat is, if your windows and doors let in drafts it’s all for naught. 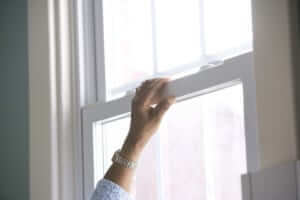 Heat loss through windows is responsible for 25%–30% of residential heating and energy use. This can really add up over time and you’ll feel it when your energy bill arrives. One of the easiest ways to determine how secure your windows and doors are is to take a match or lighter and hold it near the edges of your windows and doors. If the flame flickers your windows and doors aren’t doing their job. 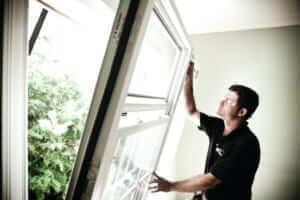 Drafts can be caused by poor insulation around the windows or by hardware issues with the windows themselves. Look at the frames. In the Midwest, the seasonal temperature changes can take a toll on your window and door frames. We often see window and door frames that have been wrapped or deteriorated by the change of seasons in Iowa. Look specifically at the corners and joints of the frames, as this is where deterioration often starts. Vinyl window and door frames tend to have fewer problems with warping and deterioration than wood or aluminum, which is one of the reasons vinyl is a good choice for Iowans. Your windows should open and close with ease. If you have to struggle to open and close your windows, you most likely have a hardware issue. Over time, use (especially with hung and sliding windows) and weather extremes take a toll on the hardware inside your window frames and can rust or breakdown important components. Check the caulking around the outside of your windows and doors. The caulking should seal your windows and doors to keep weather and moisture outside and comfortable temperatures inside. Caulk is often one of the elements of a window or door that has the shortest shelf life. If you notice any breaks in the caulking around your window and door frames this means that the seal has been broken and depending on how long it has been broken, you may have serious deterioration of internal window or door components. Don’t neglect your windows. Drafts, moisture and poor insulation don’t just affect your home’s energy efficiency, they can also lead to rotting and additional problems in the structure of your home. If you notice any of the problems mentioned above it’s best to call a professional for an in-person assessment. Every home is different and having a professional who knows what they are doing will save you a lot of trouble in the long run. You can start assessing the fitness of your windows and door right away and spring is a good time to get any of your problem windows and doors replaced. If you have to replace your windows, choose vinyl windows that are Energy Star qualified and have double or triple-pane insulating glass. See some of Tri-County’s Wincore windows and doors or schedule an in-person estimate with a trained professional.